Glucose levels were monitored after a single bout of high-intensity interval training (6 × 1-minute intervals) and 30 minutes of moderate-intensity continuous training on separate days. A single episode of high-intensity interval training (HIT) or a bout of moderate-intensity continuous training (MICT) after fasting did not increase the risk for hypoglycemia in individuals with type 1 diabetes, according to findings published in the Journal of Clinical Endocrinology & Metabolism. Moderate-intensity physical activity is recommended for individuals with type 1 diabetes, but marked declines in blood glucose levels have been associated with a single bout of moderate intensity exercise. In the current study, researchers assessed the effects of a single bout of HIT and MICT after an overnight fast on both acute and 24-hour glucose concentrations in 14 individuals with type 1 diabetes. Glucose levels were monitored after a single bout of HIT (6 × 1-minute intervals) and 30 minutes of MICT on separate days, and then were compared with a control day of no exercise. 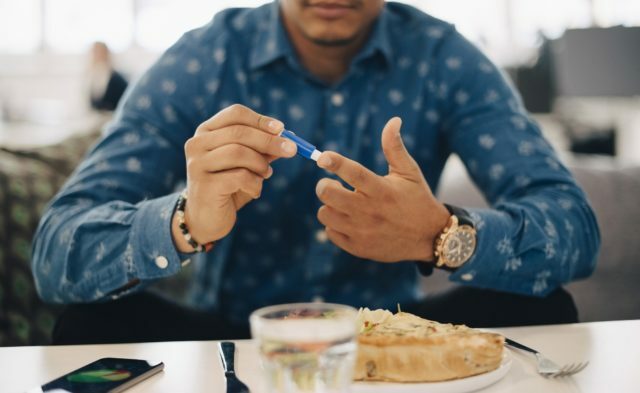 Participants exercised after an overnight fast without short-acting insulin, and blood glucose samples were obtained both pre- and postexercise. There were no differences in the incidence of/percentage of time that was spent in hypoglycemia, hyperglycemia or the target glucose range between HIT, MICT and the control day without exercise (P >.05). In addition, blood glucose concentrations were not significantly (P =.49) different between pre- and postexercise with HIT (+0.39 ± 0.42 mmol/L) or MICT (−0.39 ± 0.66 mmol/L). “Based on our findings it appears that exercising following an overnight fast before using short-acting insulin helps to maintain blood glucose stability, irrespective of the mode or intensity of the exercise, which means that patients do not need to consume carbohydrate to avoid [hypoglycemia] during exercise,” wrote the researchers.